I think my favorite part was when Sparafucile handed Rigoletto his business card. 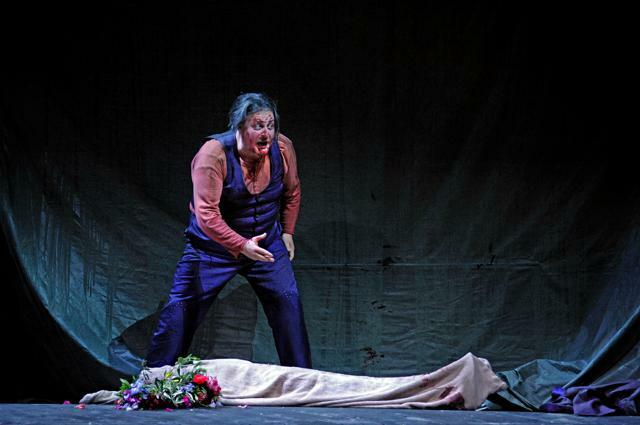 I wrote about Sunday’s premiere of Luc Bondy’s serviceable but mediocre Rigoletto for Bachtrack, and you can read the review here. Basically, this is a traditional Rigoletto with an updated grimy look. 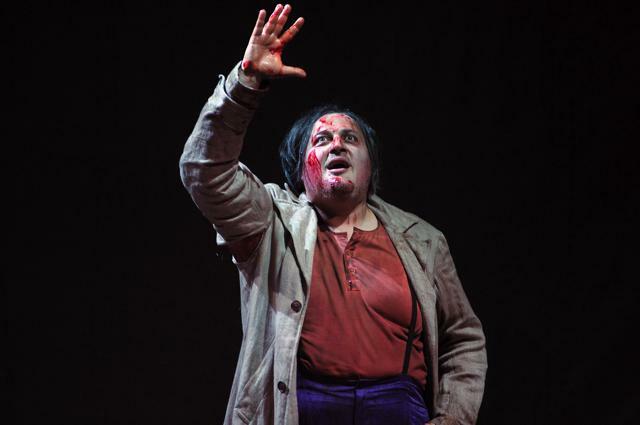 George Gagnidze in the title role is the best part of the production, but he is generally working the usual Rigoletto clichés. I tried to find a little more in Bondy’s work in the Bachtrack review above, but I may have been reaching. Its combination of static sections, completely conventional moments, and a few added details already resemble the third or fourth revival of a once-interesting production. But it’s still got stuff to piss off traditionalists. Let’s take a look at what! Also, more pictures. 1. The set, though the work of important designer Erich Wonder, is ineffective and looks bargain basement. 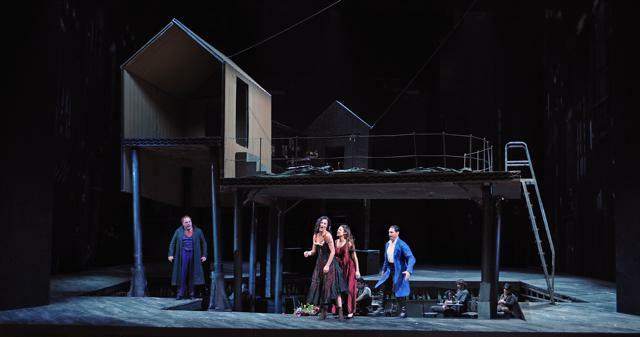 The first two acts are just some sliding diagonal walls (not really shown in any of the official production photos), the third act a two-level job that looked small on the Theater an der Wien’s stage. Resizing will be tricky: the Met is twice as big or so. 2. There is some doubling going on. 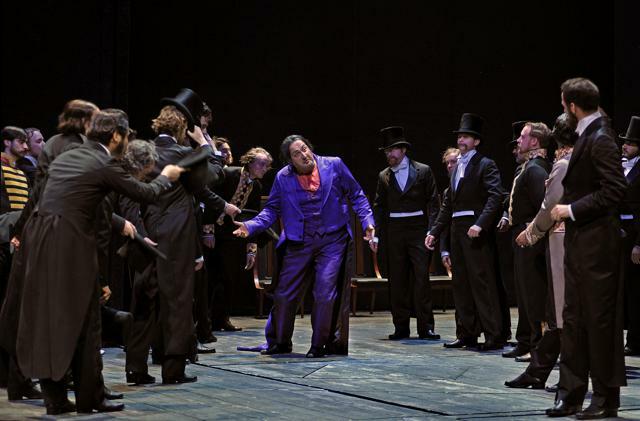 First Rigoletto and the Duke wear the same color jackets. 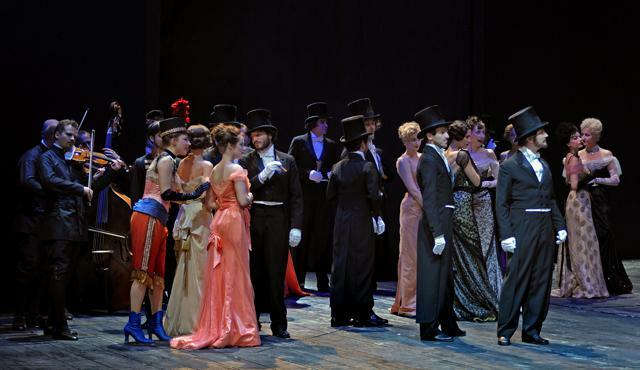 Then in Act 3, Maddalena and Gilda are kind of similar, and then Gilda dresses up as the Duke to die for him. This could have gone somewhere, but it didn’t. 3. There are a few non-literalisms. Rigoletto lacks a hump. 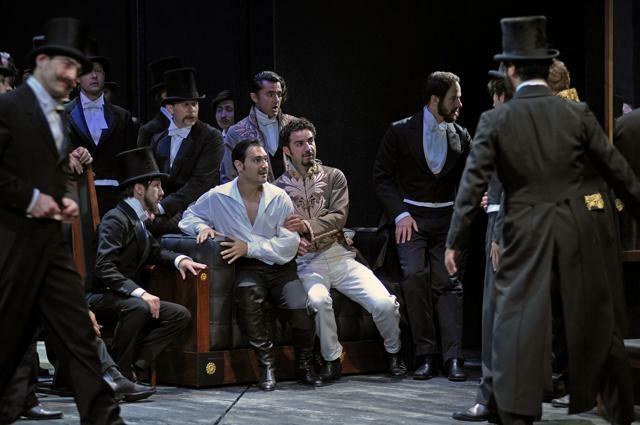 The blocking in “Bella figlia” shows Gilda approaching the Duke but him not seeing her. I thought this last bit was rather good, actually. 4. Rigoletto kind of looks like the Joker from The Dark Knight. This would make him the second Joker I’ve seen onstage in an opera this season. 5. There are some ridiculous moments. There’s the matter of the ladder I described in the Bachtrack review, which seems like it must be a retort to those who protested the candle elimination in Tosca. There are the business cards. Giovanna sneaking the Duke behind Gilda onto her bed without her noticing him courts unintentional comedy. Gilda is carried off on her bed, not protesting as a bunch of masked men abduct her (really???). 7. I actually thought the women’s dresses in the first scene were kind of fabulous. The random pantaloons ladies seemed like gratuitous male gaze decoration, though–maybe they could have had a dramaturgical function had Bondy done anything with them at all. With a Duca and Gilda who can bring more individual personality to their performances, I can see this production being sort of OK. Uh, yay?